All Mountain riding demands the best head protection. That's why Cube designed AM Race helmet, with additional protection at the rear of the head and one-handed adjustment for the ultimate fit. With 17 large vents you'll stay cool on even the toughest of trails. Ride hard, stay safe, choose Cube. Helmets are essential when riding, they might save your life. Normally, a helmet is worn for a long period of time, and that’s why a good, secure fit and efficient ventilation are mandatory. Additional protection for the back of the head thanks to deep rear section. 17 large ventilation openings for optimum cooling/air circulation. One-handed adjustable and adaptable height system for the optimum fit. Weight: 330 g (with visor). 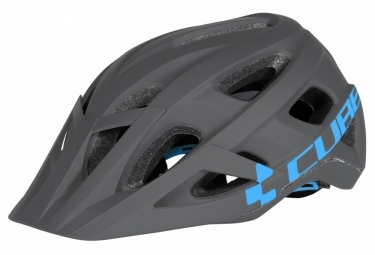 Casque CUBE AM RACE Gris Bleu clasificado 4.0 de 5 por 1. Rated 4 de 5 por Chris95 de Casque novateur Sont attache aimanté est très pratique et tout à fait fonctionnel. Ne se détache jamais tout seul. Seul inconvénient, si l'on règle la jugulaire presque à son minimum, la sangle patouille et n'est pas maintenue, dommage!